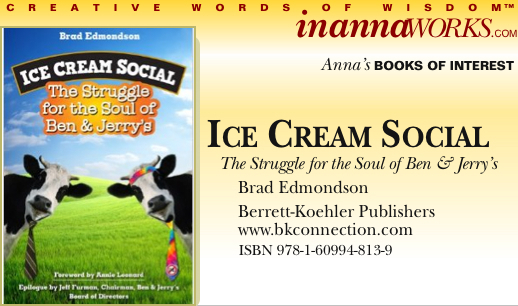 “How social is your ice cream? Ben & Jerry achieved superstar status by making really good ice cream in a socially conscious way. They did it, initially, without a mission statement or a business plan. They just wanted to make money by making and selling ice cream in a small shop in Vermont and tried not to hurt anybody while they did it. They succeeded, then failed, then changed and tried again, then sold to Unilever and changed again. This is their story. It’s told by Jeff Furman who was there for the whole ride, staying after Ben & Jerry left to fight for the ideal which Ben & Jerry’s had come to represent. The company was a test balloon sent up into the ethers of profit-hungry corporate America. Or perhaps it was more like a canary sent into a mine shaft, who survived but just barely. This book captures it all. The passion, the creativity, the business missteps, the anguish, the compromise, the To Be Continued. It’s a tale that every socially conscious American should read. 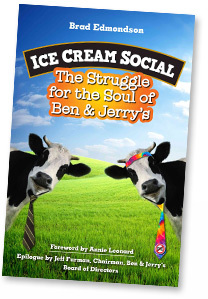 It’s a tale that every Ben & Jerry’s fan will want to read. See for yourself. SHOP FOR THE BOOK.